Earlier today I posted a link to my interview, at the Kirkus Reviews site, with UK novelist R.N. Morris. During the course of that exchange with Morris, he’d reminded me that his protagonist, Porfiry Petrovich--originally the creation of Fyodor Dostoevsky--had been the model for 1970s TV detective Lieutenant Columbo. All of this stirred my recollection of an old TV Guide essay about Columbo, Porfiry, and their mutual connections to the ancient Greek philosopher, Socrates. So I went looking through my files, and finally found the article. 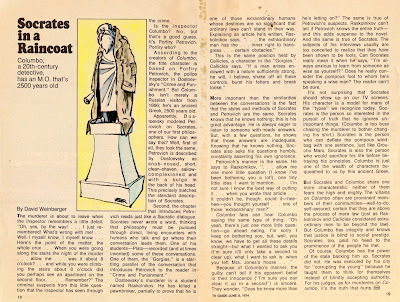 Titled “Socrates in a Raincoat,” and written by David Weinberger, it appeared in the June 8, 1974, edition of the magazine. I’ve posted it below. Click on the image for an enlargement. I'm always impressed by your knowledge, but you surpassed yourself by remembering an article from 1974...and then finding it! Brain specialists would be impressed by the filing system in your memory, and I'd be impressed by the filing system in your office! Great article and links too, by the way. A fascinating find! Thanks so much for sharing. THANK YOU for posting this. I read it when it first appeared and it made a deep impression on me. Until then I'd never thought to connect the crime shows and paperback thrillers I loved with anything else in Western culture. (I was 13 at the time, so that's my excuse.) Anyway, it's postings like this one that really add to my enjoyment of this blog. Thanks again.